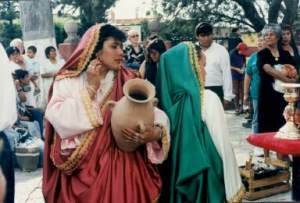 Even for those not Christian or Catholic, the cultural expressions of this, the holiest of times on the Christian calendar, is an amazing experience in San Miguel. The week is so packed with things, that it actually starts on the preceding weekend, one week prior to Palm Sunday when there is an all-night procession from the church at Atontonilco to San Miguel (17 k), carrying the celebrated, venerated and beloved El Senor de la Columna. Made out of corn meal, orchids, and other exotic materials rather than carved from wood, so it’s not so heavy and looks more lifelike. In the Mexican bloody tradition, this statue of Christ after being whipped, is pretty graphic. But Mexicans really get into the Passion, and maybe the violent reality of their religious art help them to feel their religion more. Then the Friday before Palm Sunday is the Day of Our Lady of Sorrows, and families and communities work all night creating beautiful altars in their homes and windows, and in the many neighborhood fountains scattered around town. I was lucky in that the family owning the building in which I live created the most beautiful one I saw right in my own entryway. There are certain symbolic requirements to these altars, and the one made by Jorge and Sandra had everything: purple pots of growing wheat, white lilies, statues of Mary weeping at the foot of the Cross, bitter oranges, purple and white flags, tons of fresh chamomile, white candles, and then most amazing, a purple carpet made of sawdust with different designs stenciled in natural sawdust. The whole family, friends, tenants, and maids worked for hours creating this altar in the entranceway and on the sidewalk in front of our building. Then at night people visit the various altars and are given frozen fruit ices and hot rice pudding. And the next day they were all gone, taken down as quickly as they were put up. The jacaranda trees here cooperate and bloom in perfect purple timing with the color of Lent, unlike the trees in Los Angeles where I am from, which get dressed in May. 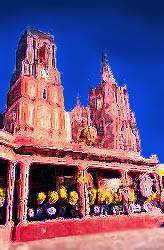 In San Miguel it seems divinely coordinated with the holy season. The next night happened to be my birthday, and in a weak moment I had invited lots of people to a party. I heard the best tamales were made by the cloistered nuns in the convent, but when I went to order some in the church at the little curtained window, the sister told me that because of Santa Semana they were not cooking. My friends and I partied up on the and ate the tamales I had bought from the tamale lady in front of the Oratorio, and drank cerveza and generally had a fine time. Unfortunately the only dancing was by me and Adrian, a young Mexican artist who had spent some salsa time in L.A. But the music was great (my CDs from Cuba), and the gringos and Mexicans all mixed together in both languages and so I became 39, again. Palm Sunday at St. Paul’s Anglican Church, which I attend, was very nice, and also very familiar, since the liturgy is so similar to the Lutheran. However I couldn’t help but feel the Mexicans were doing it up so much better. In front of every Catholic Church (and believe me, there are a lot in this town!) and on the Jardin were artisans who had woven elaborate designs out of fresh palm fronds–flower baskets holding purple flowers, shields, angels, crosses, bouquets–as many designs as there were designers. The palm art were all about 14″ or so high, cost 5 pesos (50 cents), and many people took them home as bouquets after the service. By contrast, at St. Paul’s we were given dinky little skinny palm leaves about an inch wide that felt quite lacking as we processed into the church. Why not make a deal next year with the Mexican artisans to sell their designs in front of the gringo church too? Wednesday in the late afternoon a crowd gathered in front of the baroque Oratorio. The sun was setting, colors streaked the sky and turned the acolytes white garments rose as they waited patiently with their incense, tall candlesticks and golden crosses at the top of the church stairs. Behind them were a hundred women of all ages in formal black, from cocktail dresses and sequins to simple cotton, some carrying their shoes as well as symbols of the crucifixion. Two little girls yanked on my sleeve and we started a conversation, and I took their pictures. Sisters there with their father, we admired each others clothing and exchanged names and ages (they were 7 and 8). Oh if only my Spanish were better! Way up high in the tower were more teenaged boys in white, fooling around while waiting for the time to peal the huge bells. Finally the traffic was stopped and the procession began, with angels and Roman soldiers and solemn drummers and THEN when the beloved statues were hand carried on flower bedecked litters out of the church, I couldnt help but catch my breath. Men in crisp white shirts and formal black slacks carried Christ with his cross, but it was WOMEN who carried the othersMary, Magdalene, John, Veronicatiny women all in black, most barefoot, with the heavy wooden stretchers over their shoulders. There wasnt a cleric in sight. This was a peoples procession. So when the crowd fell in behind the procession as it wended its way up the hill and on to the Stations of the Cross, I cut out and ran over to the Bibliotecas theater where Jesus Christ Superstar was just beginning. Afterwards I found myself drawn back at the Oratorio, just in time to see the procession return to the church. There had been a downpour during the movie, I had heard it on the roof. Now two hours later the procession was damp, weary, still proud. Even more of the ladies in black were barefoot, but the teenagers wore their high platforms with pride after hours of walking the rough streets of San Miguel. The little girls in white still held forth their bread, the prom-queen angel still held out her full tulle skirts, but everyone looked tired. Then up the hill in the distance appeared the moving lanterns, candlelight progressing slowly in the dark, lighting the way for the venerated statues. By the time the last of the procession entered the church, I was emotionally exhausted, and I turned to the picnicking families, the candy and tamale vendors, the balloon men with relief. Holy Thursday I attended a gringo lecture on Rabbits, Eggs, and The Blood of Christ And then I visited the churches, which were all open as is traditional this night. One is supposed to visit seven, but in San Miguel the churches are so many and so close together I actually did eight in short order. People file quietly in, pray, touch the statues, receive manzanilla flowers, a roll of bread, a purple palm cross for a donation at the many tables set up by teenagers in the sanctuaries. There is a great suspense in all the churches, altars are covered, people are awaiting the Eucharist, the bread and wine. The town was jumping, packed with tourists and residents, no one was home. Some shops were open, singing poured out of the cantinas swinging doors, there was no place to sit in the Jardin. Vendors were selling everything everywhere. A friend from Canada invited me to join her group at Mama Mias for drinks, but I just wanted to go home alone. I did flick on the tube, though, and almost every channel had Bible movies or film of Holy Week parades and appearances of the Pope. But all of this pales in comparison with Good Friday. There were three processions, the last one in the evening consisting of hundreds and hundreds of participants, including two choirs and a real orchestra with accordions, violins, and lots of dark brass, carrying their music stands. All of the women litter bearers wore black with white gloves and black lace mantillas, the men all in black suits, white shirts, and black ties. A real funeral cortege, men wearing hats along the sidewalks were asked to remove them, and the crowd watched the procession with respectful silence, even the children. 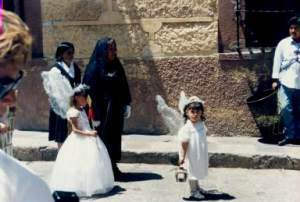 Right before the arrival of the glass coffin with the body of Jesus, little girls spread manzanilla over the cobblestones, and the air was fragrant with perfume as the flowers were trod upon. Nothing mechanical or electronic, no Animatronic giant moving floats, only people power, and it was powerful. This was the church brought out into the streets and into the lives of the people. 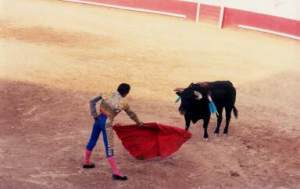 Saturday, instead of the Blood of Christ, there was blood and sand at the bullfight arena in the center of town. A charity event to raise money for the orphanage, it seemed somehow a fitting activity for Holy Week. Though averting my eyes on occasion, I had to appreciate the color, courage, and grace of men and beasts in the ring. At night the churches held candlelit Easter Vigils, but I went dancing at la Cava de la Princessa with a group of crazy artists from Calgary. 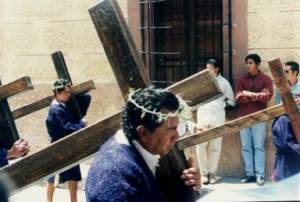 Easter Sunday is the day that life-sized effigies of Judas, other bad characters, and politicians are strung up in front of the government buildings along the Jardin, and blown to bits one by one at noon after church services. Its a great catharsis and a fitting end to an intense week of passion, emotion, blood and death, and resurrection.